Even though officially we are in holiday mode at Red Pepper Quilts HQ, the end of year preparations are keeping me off my usual game, preoccupied with getting in the spirit, sourcing Christmas presents, socializing, and paid work. How sweet are these decorations though? Purchased at the American Folk Art Museum - Lincoln Branch (December 2007) in NYC. This is a small museum which can be a little hard to find, with a permanent collection of quilts, well worth the effort of seeking out if you find yourself in out on Manhattan's Upper West Side. These decorations are made from recycled materials including buttons, and aluminum pull tabs from cans. Very very clever! Although they are Christmas decorations, they have been on display all year round as inspiration and a reminder of good times in NYC. The call of the yarn has also not gone unheard, and I have started a small lace knitting project. 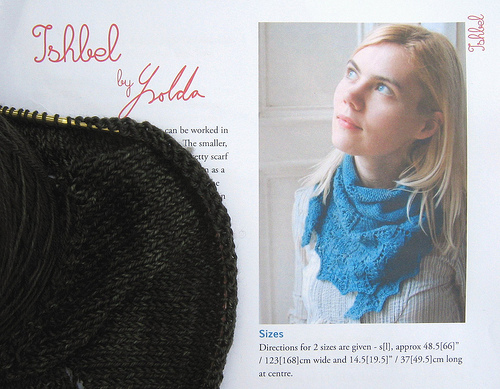 The pattern is Ishbel by Ysolda and I am using Malabrigo Sock yarn in Alcaucil. This is a simple shawl pattern, very well reviewed on Ravelry with over 4000 Ishbel projects to peruse made from a myriad of different yarns. If you are not familiar yet with Ravelry and you are a knitting and yarn fiend be sure to sign up, it is without a doubt the most comprehensive and fun knitting and crochet community. Those ornaments are so neat! The American Folk Art Museum is on my list for our next NYC visit. I'm also making Ishbel (or will be) for my mom for Christmas. fun upcycling of those shirt buttons. I'm going to try that! Ishbel is turning the world ... I think it must be the most widely knitted pattern at the moment. I can't wait to see the finished item. Pop can tabs have never been so pretty. Love the button ones, too! 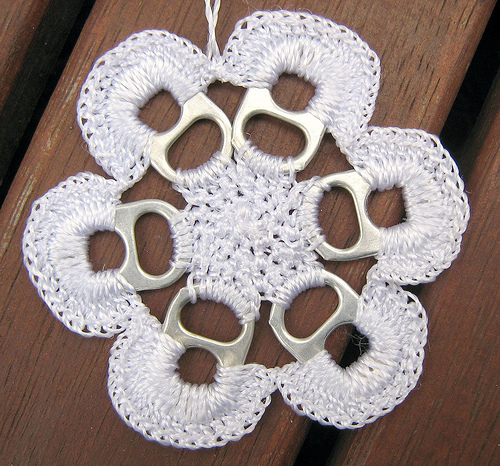 I never would have thought to use soda tabs in that way! Neat. I've planned to knit a scarf or two for christmas gifts...we'll see if they get done! what beautiful decorations...no wonder they are up all year! Love the Christmas ornaments. Very nice. 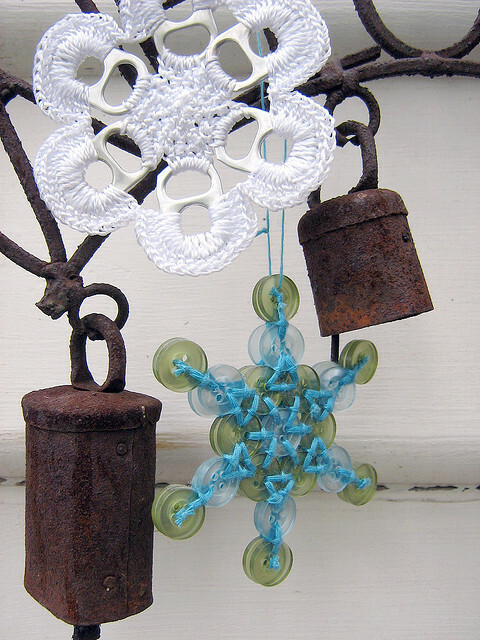 I love those ornaments; snow flakes made from buttons - what a great idea!